20We describe a novel formulation of light beam propagation through any complex optical system that can be described by an ABCD ray-transfer matrix. Within the paraxial approximation, optical propagation can be formulated in terms of a Huygens principle expressed in terms of the ray-transfer ABCD matrix elements of the optical system. 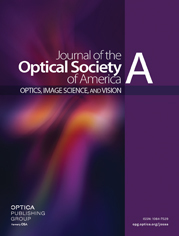 We extend and generalize previous treatments to include the effects of finite-sized limiting apertures (i.e., diffractive screens) in the optical train, tilt and random jitter of the optical elements, and distributed random inhomogeneities along the optical path (e.g., clear air turbulence and aerosols). In the presence of limiting apertures the ABCD matrix elements of the optical system are complex. For the case of laser beam propagation and Gaussian-shaped limiting apertures in the optical train, we obtain analytical expressions for both the spot radius and the wave-front radius of curvature at an arbitrary observation plane and give illustrative examples of practical concern. In particular, analytical expressions for the fringe visibility obtained in a coherent laser interferometric system are presented. An analytical expression for the mean spot radius of a laser beam propagating through an optical system in the presence of tilt and random jitter is obtained. We also consider the propagation of partially coherent light through optical systems. In particular, we derive a generalized van Cittert–Zernike theorem that is valid for an arbitrary optical system that can be characterized by an ABCD ray-transfer matrix. Finally, the propagation of laser beams through a general optical system in the presence of distributed random inhomogeneities is considered. An explicit expression for the mean irradiance distribution of a Gaussian-shaped beam is derived that is valid for an arbitrary optical system. In addition, we derive an expression for the mutual-coherence function for wave propagation through an arbitrary optical system. In all cases the results are expressed in terms of the ABCD matrix elements of the complete optical system. The formulation of optical propagation presented here is a rather simple and straightforward way of determining the effects of finite-sized optical elements, tilt and random jitter, and distributed random inhomogeneities along the optical path. It is merely necessary first to multiply the relevant ray matrices together to find the complete system matrix and then to substitute this matrix into the expressions given in this paper. a Taken from Refs. 9 and 18.
a Shown are the ray matrices, taken from Ref. 19, for an ellipsoidal surface where one of the principal axes lies in the plane of incidence of a wave incident upon the surface with an angle of incidence θ; that is, for an ellipsoidal surface, the plane of incidence of the light beam is restricted to one of the planes of symmetry of the optical element; or the rotation of any tilted ellipsoidal element in an optical system is restricted to be about one of its two principal axes. Although this does not cover all possible cases, it probably does cover the majority of cases in which ellipsoidal (e.g., cylindrical) elements are introduced deliberately into an optical system in order to achieve (or to compensate for) a particular astigmatic effect.